Above is what a Korean “criminal record” (범죄경력자료) looks like (when requested by the police). Do not worry; it is a made-up record of a fictitious person. But, it does resemble a real record. These are used in mock bar exams, etc. As you can see, the fictitious person (Lee) has previously been convicted (found guilty) of crimes on two separate occasions. The blue rectangle contains info about his first conviction, while the purple rectangle contains info about his second. Not all illegal/unlawful acts are crimes. 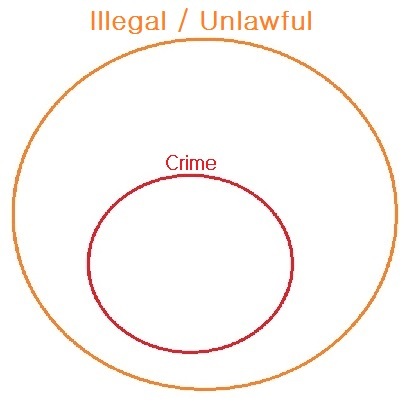 But, all crimes are illegal/unlawful. In Korea, a “crime” can be spotted by the punishment outlined for a “violation.” If the specific punishment outlined is a “criminal punishment,” this makes the “violation” a “crime.” Simple. So, if the outlined punishment for a “violation” contains any one of the above, that “violation” is, in fact, a “crime.” And only convictions of “crimes” will end up on a person’s criminal record. If the outlined punishment for a “violation” are merely “과태료” (administrative fine) or “범칙금” (ticket/fine), that “violation” is not a “crime.” A “fine” only in the form of “벌금” or “과료” is a criminal punishment (i.e., #6 and #8 above). 1) “범칙금” -> Not a Crime. 2) “과태료” -> Not a Crime. 3) “벌금” or “과료” -> Crime! The punishment for traffic violations such as “Tail Biting” (꼬리물기) or “Cutting In” (끼어들기) are “과태료” or “범칙금.” This means such violations will not end/show up on the violator’s criminal record. In contrast, the punishment for “DWI / Drunk Driving” (음주운전) is “벌금” (criminal fine) or imprisonment. A person found guilty of “DWI / Drunk Driving,” therefore, will see such a conviction end up on his/her criminal record. In Korea, crimes are often regulated under multiple laws. The rule is that “special laws” take precedence over “general laws.” The Criminal Act (형법), a general law by design, functions as a “catch-all” law, so to speak. Sadly, special laws are scattered all over the place. This is essentially why Korean law is potentially confusing. Korea has criminal jurisdiction over all crimes committed within the territory of Republic of Korea (unless some immunity such as under SOFA or the Vienna Convention applies). By entering a country, a person is implicitly agreeing to abide by that country’s laws and regulations. Also, “mistake of law” is almost never a valid criminal defense (i.e., “Wow, and that’s a crime here??”). “Mistake of law” (법률의 착오) in Korea only refers to instances where, say, a government employee affirmatively/specifically explained to someone a particular law erroneously. And, that person was mistaken as a result. Korea also has criminal jurisdiction over all Korean nationals whether the crime was committed within the Republic of Korea or abroad. Koreans who engage in gambling (even abroad) may be prosecuted once in Korea. For Koreans, gambling (and habitual gambling) is a crime under Article 246 of the Criminal Act. Theoretically, a Korean could be punished twice for the same crime. First in the host country, and then in Korea. Now, there is also something called an “investigation record” (수사경력자료). It resembles a criminal record except it contains info only about investigations (of a person). So, anything falling short of a conviction would be found there. This includes dispositions of non-indictment, whether currently on trial, acquittals, etc. There is one very important difference between criminal records and investigation records. Investigation records are expunged (i.e., permanently deleted from all archives) after a certain period of time (e.g., max 10 years), whereas criminal records are never expunged. This means records of all convictions remain in the Korean police/prosecution/court “hard drives” indefinitely. Why are the two treated differently? Because of the relevant law. In the Act on the Lapse of Criminal Sentences (형의실효등에관한법률), there exists a provision specifically mandating investigation records be “expunged” (삭제) after a period time. In contrast, no such provision exists for criminal records! Do you think keeping (indefinitely) a person’s criminal records (no matter how minor) is unconstitutional? One person did. In 2012, the Constitutional Court of Korea rendered a decision which found “constitutional” Articles 8(1) and 8.2(1) of the Act on the Lapse of Criminal Sentences. A man had filed a constitutional complaint arguing his constitutional rights (i.e., right to privacy and equality) had been infringed. He pointed out that the above articles failed to specify any “mandatory deletion” provision with regard to criminal records (unlike investigation records). Earlier in 2010, the man had been found guilty of drug-related crimes and sentenced to 4 years in prison. At the time, his prior convictions (of gambling in 1994) were taken into account in sentencing. He thought that was unfair. In a 5:2 decision, the Court found the articles to be constitutional. The five Justices saw keeping criminal records indefinitely as essential not only in sentencing (during trial), but also in identifying suspects or determining reasonable suspicion (during investigation). They also felt the probability of criminal records falling into the wrong hands was, at most, minimal. The two dissenting Justices felt the duration was unnecessarily long. 2) Based on the principle of reciprocity (i.e., the foreigner’s home country does not recognize such a right to Koreans there). Meanwhile, even courts (not just individuals) may ask the Constitutional Court for a review. When a court (in the midst of a trial) strongly suspects that the criminal law (in question) might, in fact, be unconstitutional, it may ask (directly) the Constitutional Court for a review of that law. This is called “위헌법률심판제청.” Such a court will wait until the Constitutional Court renders a decision (on constitutionality) before rendering its own (guilty / not guilty) decision. Because the guilt is dependent on the constitutionality of that (criminalizing) provision(s) in question. In order to access one’s own criminal/investigation records, a person must fill out an application at the police station. He/she must also present a valid ID. 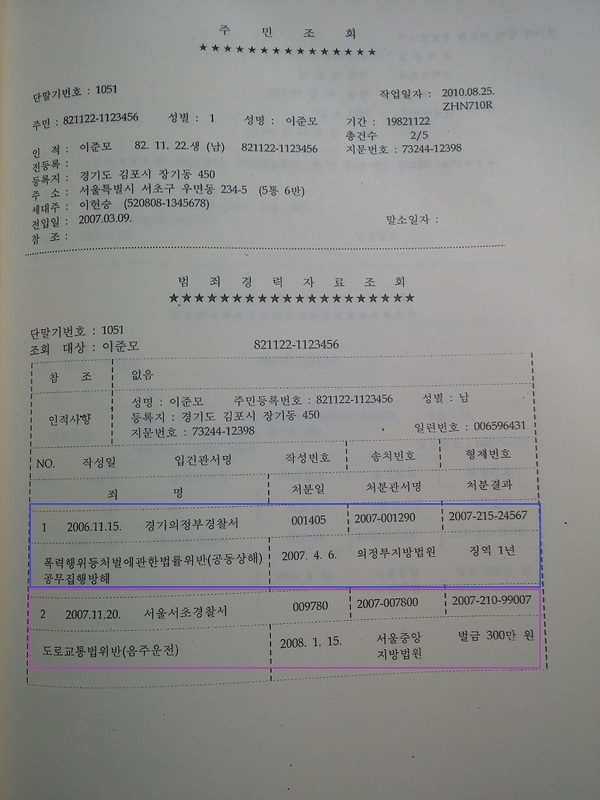 When a person is found guilty of a crime and the sentence is a criminal fine (벌금 or 과료) + he/she subsequently pays that criminal fine, such a person can choose not to have his/her criminal fine appear on his/her criminal record (for documentation purposes) so long as 2 years has elapsed since payment. After such 2 years, the fine sentence is said to have “lost effect” (실효). Just be sure to not check the above red part. Checking it will make all of your criminal records appear. Even ones that have “lost effect.” But remember, all criminal records are stored in the database indefinitely. They are never expunged. Some organizations deliberately ask applicants to submit their criminal records that include even sentences that have “lost effect.” They are asking the applicants to check even the red part. The problem here is that no law currently forbids such a demand. After all, the applicant him/herself is obtaining (for submission) his/her own criminal record “voluntarily.” The 3rd party is not directly accessing such info. In Korea, convictions on one’s criminal record are never expunged. You can, however, choose to have certain minor/old convictions not appear for documentation purposes. On the application, do NOT check the “실효된 형 포함” square.